Most of the cases of dengue-associated AKI occur due to dehydration, and loss of fluids leads to pre-renal failure. Thrombotic microangiopathy is an unusual complication associated with dengue viral infection. The activation of complement pathway plays an important role in infection-associated thrombotic microangiopathy. It can be triggered by activation of classic and lectin pathways on the recognition of pathogens by antibodies (classical pathway) and pattern recognition molecules (pentraxins and C1q for the classical pathway; lectins and ficolins for the lectin pathway). Alternate pathway activation can also be triggered by infections. C3b deposited on surface of pathogens together with complement factor B forms the alternative pathway C3b/Bb C3-convertase. It cleaves additional C3, resulting in a positive feedback mechanism. C3b is deposited on the surface of pathogens and binds to specific receptors on leukocytes, resulting in phagocytosis of complement-tagged cells. Thrombotic complications have been reported less commonly in patients with dengue., In this article, we describe an atypical presentation of dengue fever manifesting as thrombotic microangiopathy. A 32-year-old male presented to the emergency department with complaints of fever and body ache of 4 days. The patient was detected to be dengue-positive by nonstructural protein 1 antigen testing at a district hospital. He was managed conservatively with intravenous fluids. Over the next few days, the patient's urine output gradually reduced. The patient was referred to our hospital for further management. At the time of admission, the patient was afebrile and dyspneic. He had mild pallor and generalized swelling all over the body. The patient had no history of kidney disease. He was not a known case of diabetes mellitus or hypertension. There was no history of any addiction, nonsteroidal anti-inflammatory drug abuse, or any alternative drug intake. Investigations revealed hemoglobin level of 9.3 g/dl, platelet count of 76,000/cumm, and serum creatinine of 10.6 mg/dl. Peripheral blood smear examination showed the presence of schistocytes, spherocytes, and polychromatophils. Reticulocyte count was 6.8%. His serum electrolyte levels were within normal limits. Total serum protein was 4.74 g/dl, and serum albumin was 2.55 g/dl. Prothrombin time measured 13.5 s, with an international normalized ratio of 1.3. Serum lactate dehydrogenase (LDH) level was 1349 mg/dl. Twenty-four hours urine output was 360 ml. Urine examination revealed proteinuria and microscopic hematuria without any casts, crystals, pus cells, or eosinophils. Urine spot protein: creatinine ratio was 1.48. Urine culture was sterile. C3 and C4 levels were within normal limits (C3:1045 mg/L and C4: 184 mg/L). Serum antinuclear antibody, cytoplasmic-antineutrophil cytoplasmic antibody (ANCA), and perinuclear-ANCA were negative. Serum levels of complement factor H (CFH) were within normal limits (260 μg/ml) and anti-CFH autoantibodies were not detected. Ultrasonography of kidneys revealed normal-sized kidneys, with raised cortical echogenicity, and a partial loss of corticomedullary differentiation, suggestive of Grade II medical renal disease. In view of oliguria, anemia, and volume overload, hemodialysis was done with packed red blood cells. After taking informed consent, a decision to perform a kidney biopsy was taken. Two linear renal tissue cores were taken and sent for light microscopy and immunofluorescence studies. 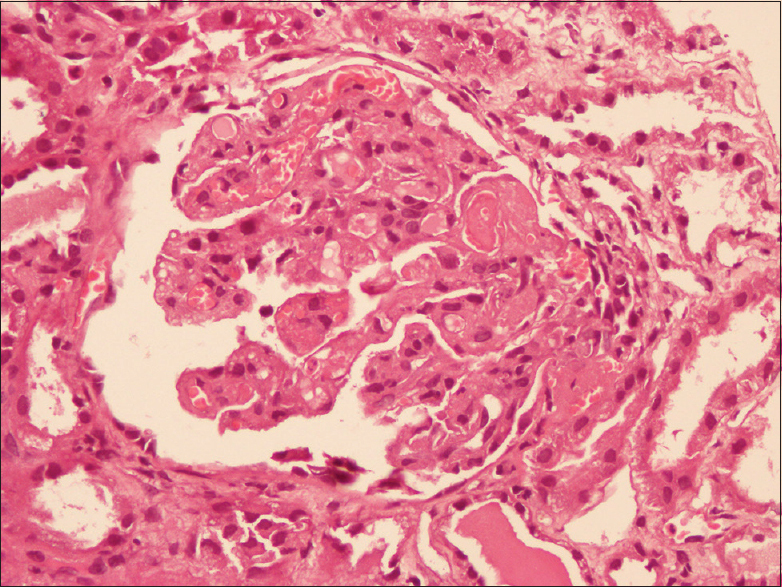 The biopsy revealed features of thrombotic microangiopathy with glomerular capillary microthrombi along with fibrillary appearance of mesangium [Figure 1]. Few of the glomeruli showed solid bloodless appearance along with focal reduplication of glomerular capillary basement membrane. Proximal tubules showed focal flattening of lining epithelium, and interstitium showed mild lymphocytic infiltrate. Blood vessels showed mild intimal edema. The patient was initially managed with hemodialysis (3 h session) for 2 days along with fluid restriction. Gradually, over a period of 8 days, the patient's swelling subsided, and urine output improved. The investigations at the time of discharge were hemoglobin level of 10.5 g/dl, platelet count of 403,000/cumm, serum creatinine of 2.31 mg/dl, and LDH of 266 mg/dl. On peripheral smear examination, there was no evidence of hemolysis. The reticulocyte count was 0.8%. On follow-up, 9 months post-discharge, patient is asymptomatic with normal renal function. In India, the first confirmed outbreak occurred in Kolkata in 1963–1964. Over the years, dengue has spread throughout the country with increasing severity of infection, resulting in the first major nationwide outbreak of dengue hemorrhagic fever in the year 1996. There was a dramatic increase in the number and frequency of outbreaks, and, at present, in most of the states of India, all four serotypes are prevalent. Dengue fever can either be asymptomatic or symptomatic. Symptomatic disease can be in the form of dengue fever, dengue hemorrhagic fever, and dengue shock syndrome. Expanded dengue syndrome is characterized by unusual manifestations of patients with severe organ involvement such as liver, kidneys, brain, or heart. These unusual manifestations are the result of prolonged shock with organ failure or patients with comorbidities or coinfections. It is usually associated with dengue hemorrhagic fever but can also develop in patients who do not have evidence of plasma leakage. AKI is an important, unusual manifestation of dengue. Retrospective studies have shown that the development of AKI was associated with a longer hospital stay and higher mortality. The incidence varies according to the population studied and the criteria of AKI ranging from 0.9% to 35.7%. Thrombotic microangiopathy is a severe occlusive microvascular thrombotic syndrome characterized by profound thrombocytopenia, microangiopathic hemolytic anemia, and symptoms of organ ischemia. Various viral infections have been associated with thrombotic microangiopathy. Among Flaviviridae family, hepatitis C virus and dengue virus have been described to cause thrombotic microangiopathy. Limited literature is available on the exact pathogenesis of dengue fever-associated thrombotic microangiopathy. In one of the case reports, the role of acquired ADAMTS13 inhibitor has been described in dengue fever-associated thrombotic microangiopathy. In this case, the ADAMTS13 activity was <5% of the normal human plasma, and antibodies to ADAMTS13 were also detected. In our case, we have not measured ADAMTS13 levels or antibodies to ADAMTS13, and the presence of acquired ADAMTS13 inhibitor could be the possible pathogenesis. In a case report of thrombotic microangiopathy following dengue virus infection in a 6-year-old female child from India, the patient presented with fever and oliguria. She was managed with plasmapheresis along with hemodialysis and supportive treatment. At 6 months of follow-up, the child was asymptomatic with normal renal function. Another case of dengue fever-associated hemolytic uremic syndrome with hypertensive crisis has been described in an 8-year-old boy from Indonesia. The patient was managed with hemodialysis, antihypertensive medications, and supportive care. At the end of 6 weeks of follow-up, the patient was asymptomatic with normal renal function. Most cases in literature were treated with plasmapheresis and had full recovery on follow-up; however, in our case, the patient recovered without plasmapheresis. Hence, the role of plasmapheresis in such patients is debatable. Our case is important for its rarity and uncommon pathological picture. It is important to highlight such cases to understand the true prevalence of varying forms of AKI in patients suffering from dengue. It is important to diagnose these cases early so that appropriate management can be planned and life-threatening complications be prevented. Upadhaya BK, Sharma A, Khaira A, Dinda AK, Agarwal SK, Tiwari SC. Transient IgA nephropathy with acute kidney injury in a patient with dengue fever. Saudi J Kidney Dis Transpl 2010;21:521-5. Motla M, Manaktala S, Gupta V, Aggarwal M, Bhoi SK, Aggarwal P, et al. Sonographic evidence of ascites, pleura-pericardial effusion and gallbladder wall edema for dengue fever. Prehosp Disaster Med 2011;26:335-41. Noris M, Mescia F, Remuzzi G. STEC-HUS, atypical HUS and TTP are all diseases of complement activation. Nat Rev Nephrol 2012;8:622-33. Horvath R, McBride WJ, Hanna JN. Clinical features of hospitalized patients during dengue-3 epidemic in far North Queensland 1997-1999. Dengue Bull 1999;23:24-9. Wiersinga WJ, Scheepstra CG, Kasanardjo JS, de Vries PJ, Zaaijer H, Geerlings SE. Dengue fever-induced hemolytic uremic syndrome. Clin Infect Dis 2006;43:800-1. Khalil MA, Tan J, Khalil MA, Awan S, Rangasami M. Predictors of hospital stay and mortality in dengue virus infection-experience from Aga Khan University Hospital Pakistan. BMC Res Notes 2014;7:473. Aroor S, Kumar S, Mundkur S, Kumar M. Hemolytic uremic syndrome associated with Dengue fever in an adolescent girl. Indian J Pediatr 2014;81:1397-8. Hadianto MT, Mellyana O. Hemolytic uremic syndrome and hypertensive crisis post dengue hemorrhagic fever. A case report. Paediatr Indones 2011;51:372-6. Gupta E, Ballani N. Current perspectives on the spread of dengue in India. Infect Drug Resist 2014;7:337-42. Lopes da Silva R. Viral-associated thrombotic microangiopathies. Hematol Oncol Stem Cell Ther 2011;4:51-9. Rossi FC, Angerami RN, de Paula EV, Orsi FL, Shang D, del Guercio VM, et al. A novel association of acquired ADAMTS13 inhibitor and acute dengue virus infection. Transfusion 2010;50:208-12.